Unicompartmental knee replacement (UKR) is an established treatment for end-stage medial compartment arthritis, providing good pain relief and restoring function. The Oxford knee is the most widely-used UKR, with long-term survival comparable to that achieved with total knee replacement, provided that the indications and surgical technique are appropriate [1,2]. The aim of this article is to present our experience with an alternative option for an extremely rare situation that a surgeon may unexpectedly face. We describe the management of two cases of posterior dislocation in which the mobile bearings could not be retrieved through a mini-anteromedial approach. Rather than making a separate posterior approach, these displaced bearings were left in situ and a new one inserted, providing a stable articulation. Below, we review the literature and discuss treatment strategies for this rare complication. Both patients gave their consent prior to their inclusion in this report. A 64-year old man underwent Oxford medial UKR in September 2004. He had previously had an arthroscopy of the same knee for a complex tear of the medial meniscus. The patient’s medical history included coronary artery bypass graft, atrial fibrillation, and right mid-foot fusion. He was on a number of medications including warfarin. At the index procedure, a medium-sized femoral component, 50×32 mm tibial tray, and a size 7 meniscal bearing provided a stable articulation. The knee remained relatively pain-free for 5 years, until the patient sustained a twisting injury to his knee. He developed severe pain and swelling in the knee and was unable to bear weight. He attended the A&E Department on the same day and was reviewed in the fracture clinic the following day. Radiographs demonstrated a posterior dislocation of the mobile bearing. The patient consented to either an exchange of the bearing or a revision total knee replacement. The knee was explored through the previous mini-anteromedial incision. The femoral and tibial components were found to be well-fixed with no macroscopic evidence of burnishing, abrasions, or scratching over the metal surfaces. The anterior cruciate and collateral ligaments were intact. Intraoperatively, despite an extensive search, the dislocated bearing could not be retrieved. A trial reduction with a size 9 medium meniscus provided a stable articulation with no impingement, no varus or valgus instability, and no lift-off of the trial meniscus. We decided not to explore the knee through a posterior approach for retrieval of the meniscus in order to avoid the added morbidity of a more invasive procedure. A definitive bearing was inserted and the wound was closed in layers. Total surgical time for the procedure was 1 hour; no additional antibiotics were administered. The postoperative recovery was uneventful and the patient was mobilized, fully weight-bearing, without any difficulty. The patient’s status was reviewed regularly in the outpatient clinic. Clinically he remained relatively pain-free and continued to enjoy a relatively normal function of the left knee for 2 years following insertion of the replacement bearing. 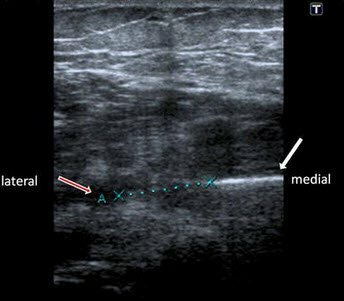 To ensure that the dislocated bearing did not migrate and endanger the neurovascular bundle in the popliteal fossa, we performed serial ultrasound scans. These scans demonstrated that the meniscus was located posteromedially, approximately 2 cm below the joint line and some distance from the neurovascular bundle (Figure 1). Its position remained unchanged. The patient did not wish to have any further surgery to retrieve the dislocated meniscal component, which would have required a posterior approach. A 61-year-old female patient treated at another center independently by another surgeon underwent Oxford medial unicompartmental right knee replacement in September 2004. A medium-sized femoral component, size E tibial tray, and a medium size 4 meniscal bearing provided a stable articulation. The patient was fit and healthy except for the history of Ménière’s disease. Postoperatively, the knee remained pain-free for 6 months following the original operation until she sustained a twisting injury to her knee. Following this, she developed pain and swelling to the right knee and was unable to bear weight. Radiographs demonstrated a posterior dislocation of the bearing. The patient consented to exploration of the knee, bearing retrieval/exchange, or revision to total knee replacement. The knee joint was explored through the old mini-anteromedial incision. Both femoral and tibial components were found to be well-fixed with no macroscopic evidence of burnishing, abrasions, or scratching over the metal surfaces. The anterior cruciate ligament and collateral ligaments were intact. Intraoperatively, the dislocated bearing could not be retrieved through the mini-anteromedial approach. A trial reduction with a size 7 medium meniscus provided a stable articulation with no impingement, no varus or valgus instability, and no lift-off of the trial meniscus. We decided not to explore the knee through a posterior approach to retrieve the meniscus. A definitive bearing was inserted and the wound was closed in layers. The knee joint was supported with wool and crepe bandages. Total surgical time for the procedure was 1 hour; no additional antibiotics were administered. The postoperative recovery was uneventful and the patient was mobilized, fully weight-bearing, without any difficulty. Her condition was reviewed in the clinic regularly. Clinically she remained relatively pain-free and continued to enjoy normal function of the right knee 4 years following surgery. The invention of a mobile-bearing knee replacement introduced the potential complication of dislocation of the mobile bearing . However, following the introduction of instrumentation to accurately balance and tension the ligaments in the phase 2 and phase 3 design of the Oxford mobile-bearing knee, the incidence of this complication in the medial compartment is only 0.5 % . The incidence of dislocation of the mobile bearing in the lateral side is higher or the ligaments are more extensible. As a result, the use of a mobile bearing in the lateral compartment with a flat tibial component is not recommended [4,5]. For a primary medial dislocation to occur, there has to be both distraction of the joint surfaces and displacement of the bearing. Displacement is usually the result of impingement of the bearing against retained osteophytes , protruding cement, or bone anterior to the femoral component. Distraction is likely to occur if there is damage to the medial collateral ligament (MCL) or if the flexion/extension gaps are not equal. The front of the meniscal bearing is about 5 mm higher than the deepest part of the bearing. So, a posterior dislocation is unlikely unless the bearing has spun, resulting in a decrease in the entrapment. With asymmetrical anatomic bearings, the risk of the bearing spinning is now low. Primary dislocations usually occur early. Secondary dislocations tend to occur later and may be associated with loosening of the metal components. Traumatic dislocation, as described in our cases, has also occasionally been reported. In our first case, the dislocation occurred 5 years after its original insertion following a twisting injury to the knee. At operation, the components were found to be well-fixed. Radiographs confirmed the presence of a narrow radiolucent line around the tibial component, which we refer to as a “physiological radiolucency” , and showed significant degenerative changes in other compartments. Despite that, the patient remains relatively pain-free. In the second case, the dislocation occurred 6 months post index procedure, again following a twisting injury. Both components were secure. The second patient also remained relatively pain-free at the time of last follow-up. In both cases, no cause for the dislocation was found except stretching of the MCL due to the traumatic twisting injury sustained by the patient. Dislocation can occasionally be treated by manipulation and relocation of the meniscus. However, arthrotomy through the old anteromedial incision is almost always required to remove the bearing and to determine and rectify the cause of its displacement. The bearing can usually be retrieved through the anterior incision, even if it has displaced to the back of the joint. In our cases, however, the bearings could not be found through the anteromedial approach, as they had migrated well below the joint line. Although a posterior approach can be used to retrieve the menisci, these two cases demonstrate that it is probably not essential. If the retained bearing causes problems in the future, it can be removed with further surgery at that point. For definitive treatment of a dislocated bearing, the underlying cause of the primary or secondary dislocation needs to be addressed. Damage to the extra-articular surface of the bearing suggests impingement. Impingement should be rectified by removing excess bone or cement. Slight imbalance of the knee can be accepted. If the bearing has been dislocated for some time, there may be damage to the metal surfaces of the components. This damage tends to be local flattening of the femoral surface or a local concavity in the tibial surface. Because the damaged area is smooth, it can be ignored. Following a trial reduction to ensure the bearing tracks satisfactorily, a new anatomic bearing of correct size should be inserted. Care should be taken to avoid over-tightening the knee as this will not prevent further dislocation and may in fact cause other problems. With gross imbalance of the knee joint, it is possible to remove the tibial plateau and insert a fixed-bearing component. Similarly, if a femoral component is loose with minimal bone damage, a new femoral component can be inserted. However, in general, it is believed that if the cause of dislocation cannot be corrected and further dislocation is inevitable, it would be better to convert the UKR to a total knee replacement. In general, treatment of a primary dislocation by addressing the underlying problem and replacing the bearing of the same size or slightly thicker is successful, and recurrent dislocation does not usually occur. This case report demonstrates that in the event of a posterior dislocation of the bearing, which cannot be retrieved through the original mini-arthrotomy, it is probably safe to leave it in situ and simply replace the bearing. S. Tibrewal is from St Bartholomew’s and the Royal London Hospitals, London, UK. S.B. Tibrewal is from the Orthopaedic Department, Queen Elizabeth Hospital, Woolwich, UK. H. Pandit, P. McLardy-Smith, and D.W. Murray are from Nuffield Orthopaedic Centre, Oxford, UK. Tibrewal S, Pandit H, McLardy-Smith P, Tibrewal SB, Murray DW. Posterior dislocation of the Oxford knee meniscal bearing: a treatment option. Journal of Orthopaedics and Traumatology. March 2014; 15(1):59-62. © The Author(s) 2013. This article is distributed under the terms of the Creative Commons Attribution License which permits any use, distribution, and reproduction in any medium, provided the original author(s) and the source are credited.